It is the Amenities at Palacio del Mar that define what luxury real estate is in Baja compared to real estate developments in general. 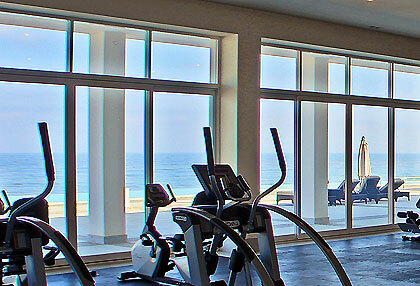 For example, Palacio del Mar is the only community on the coast that has a large indoor heated pool. But Palacio del Mar took it a step further and finished it with a granite pool floor, granite deck, a huge glass atrium above for natural light, made it semi-Olympic sized, and also found a way to make it ocean front. Another example is that Palacio del Mar is the only development on the coast that has a separate bay for truck deliveries and has a dedicated service elevator. In addition, Palacio del Mar’s water treatment plant, water softening system, and backup generator for electricity are just some of the many reasons why Palacio del Mar defines luxury real estate here on our Baja coast. Please see the list of Amenities, Under the Hood features, and Resident Services. Our elegant indoor pool has an all granite bottom and a glass top roof, for sunshine in the day and moonlight in the night. Weightlifters or cardio junkies really enjoy working out in our state-of-the-art fitness center where you can train while looking out over the shining Pacific Ocean. 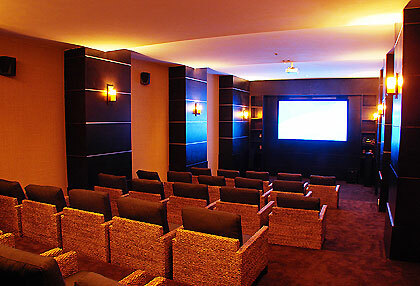 Owners and their guests gather in the spacious theater to screen movies and watch their favorite sporting events on the big screen. 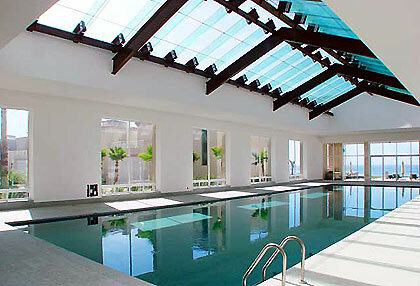 Indoor semi-Olympic sized swimming pool, heated to 80°, under a glass atrium – an excellent space. Spa facilities with His and Her sauna and steam room, locker room and full granite showers. Two large barbecue areas each equipped with a large granite bar, seating and palapa for shade. Saloon with private bar, pool tables, a large flat screen TV, wood flooring, full wall of glass, Wi-Fi, and kitchenette area for serving your guests. Yes, you can bring your own drinks. 30 seat theatre with surround sound with a large screen and a HD satellite connection. Large den with fireplace, seating, gaming table, wall of glass, and wifi. Generator to give the whole building power if the electricity goes out. Large refrigeration system to store trash to avoid smells and bugs. All the trash shoots on each level feed into this system. Water treatment plant to recycle grey waters, discrete and nicely landscaped. A dedicated truck delivery bay separate from the main lobby and main vehicle drive way. A dedicated commercial sized elevator for receiving furniture and materials. Extra water storage in case of a short term outage. Help desk at the foyer. Owner mail boxes at the help desk. Transportation Services. Use of private Palacio del Mar van for transportation with driver included with access to San Diego and Tijuana airports, Rosarito shopping, Guadalupe Valley, dinner transportation, and more. Reservations for the on-site Saloon for special owner gatherings. Wifi internet access in the Lobby, Saloon, Den, and Foyer. 24 hour entry control at front gate. Assign who you would like to enter to visit you.